Recycle and recirculate, our green-minded energy saving innovation recycles trapped warmed air from pump waste heat to efficiently keep your swim spa warm and ready, regardless of season and at a minimum of cost. Warmed air is trapped within the cavity behind the cabinet walls and the insulated TemperBase™ floor keeping the plumbing and shell warmed, performing much like a “Thermos”. 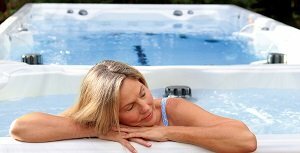 All PDC Spas swim and fitness spas are standard with this unique design making them significantly lighter in weight than foam-filled units for a much easier installation, hook-up and long-term care and operation. How Much Electric Does a Swim Spa Consume? The cost of operating your swim spa has many variables; the frequency and length of each use, the temperatures you set, the temperature around your unit, and the cost of electricity where you reside. Beware of any company that attempts to provide a cost without considering all these variables. The general rule is it will cost about $1.50 per day. Considering the efficiency in our design and operation cost control, and the benefits of home relaxation and fitness, the pluses far outweigh the minuses. Caring for your new swim spa is nothing like that of a pool! Our goal is that you spend more time enjoying relaxing in your new swim spa than maintaining it. Our powerful filtration designs assure absolute minimum of care with minimal effort. The standard EverPure2™ system purifies and sanitizes assuring no worries and little to no work on your behalf. Learn More: Swim and fitness spa water care guide. Exclusive to the patent-pending TruSwim TSX models, our pressure side design, PowerFlo™ filtration uses the power of the jet pump to push, with pressure, used water through the deep filter pleats forcing contaminants to be trapped. Clean water is returned to your swim spa having been treated with ozone, polished and clean. With PowerFlo™ there is no dirty filter cartridge within view nor a risk contaminants could be reintroduced into your swim spa as other brands often do. Our Synergy™ Series swim spas and Vitality™ Series fitness spas use the suction-side of the jet pump with the Pristine™ filtration to pull water through the filter for deep cleaning. Water is treated with EverPure2™ ozone and returned clean for your enjoyment. This reliable filtration system is standard on the hot tub zone of all TruSwim™ and Synergy™ Series dual zone models. Exclusive to PDC Spas, our EverLite2™ sight glass indicator lets you rest easy, knowing that your swim spa water is clean and pure. Simply look through the cabinet mounted EverLite2™ sight glass during filtration cycles for the bright green light indicating with confidence your spa water is treated with ozone and UV-C. For all dual zone models, the hot tub zone is equipped with EverPure™ and EverLite™ indicator mounted on the corner column as seen in the large top photo. No other manufacturer offers this unique feature assuring your confidence of having the cleanest, most pure water, with fewer chemicals.